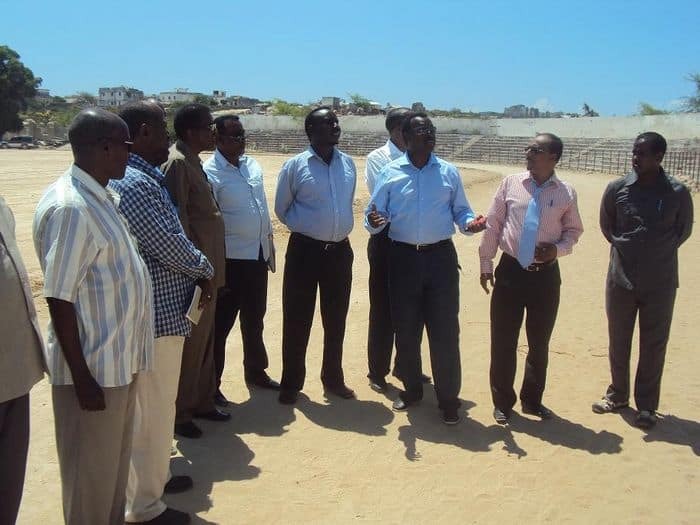 Officials from Somali youth and sports ministry, Somali National Olympic committee and Somali Football Federation on Wednesday paid an hour-long inspection to the country’s old football facility Stadium Banadir which is under reconstruction by the world football governing body FIFA. 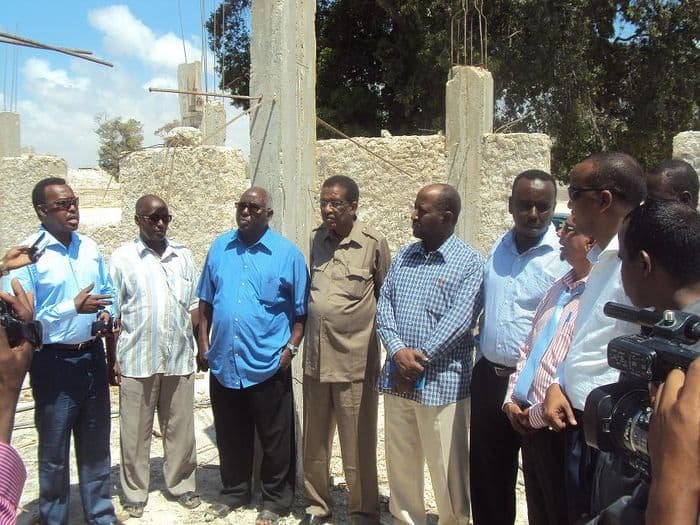 Somali football Federation secretary General Abdi Qani Said Arab told the visiting officials that the reconstruction work is smoothly under way and that the SFF was very hopeful that the reconstruction will be competed by May this year. “FIFA had spent much time and money to have Somalia get world class facility. Wars halted the construction, but peace is gradually returning. We hope the job will be completed on time without interruption,” the secretary General told the media during Wednesday’s joint visit to the stadium. 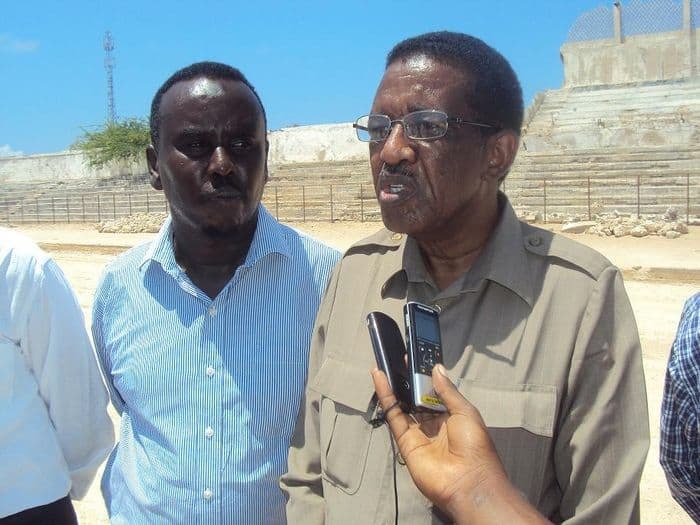 Somali Football Federation president Said Mahmoud Nur added that the Ocean stars had failed to play twice because the SFF couldn’t host international matches in the stadium. He was very hopeful that at the end of this year Somalia will play its home games in Mogadishu. “Because of insecurity and lack of international style facility, we have been using the brother nation of Djibouti as our home. 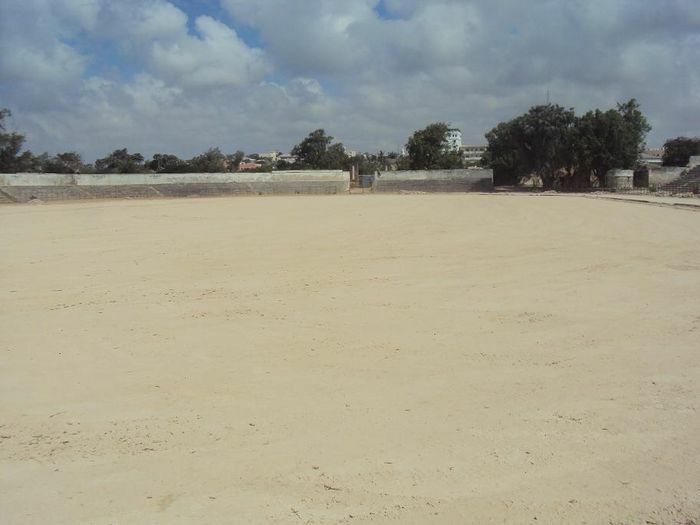 But when this construction is complete and the security has fully been tightened, we will be able to host international matches here in Mogadishu,” the SFF president told the media. He told the government officials that Somali Football almost vanish before, but the constant financial and material assistance from FIF has protected Somali football from collapsing. 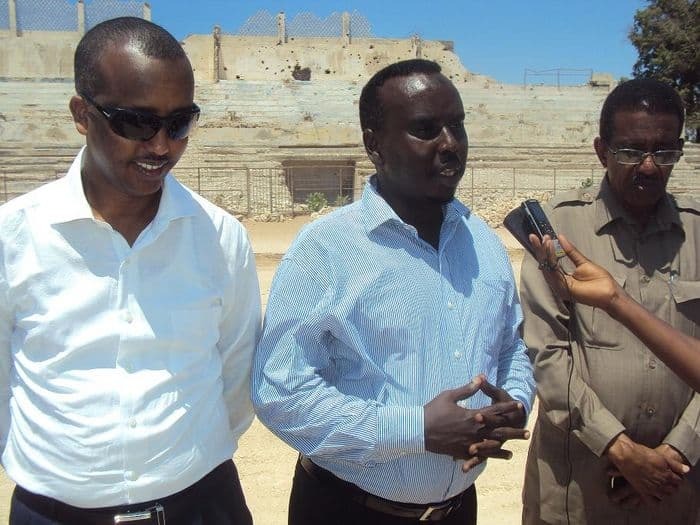 In addition, the president of Somali National Olympic committee Aden Hajji Yeberow accompanied by his senior deputy Duran Ahmed Farah said Somali NOC was very grateful to FIFA for its efforts to rebuild the old soccer stadium adding that his NOC also asked the International Olympic committee to help reconstruct the destroyed facilities in the country. “I am very happy that Somali NOC, the Somali FA and ministry of sport are doing this joint visit to the stadium today. 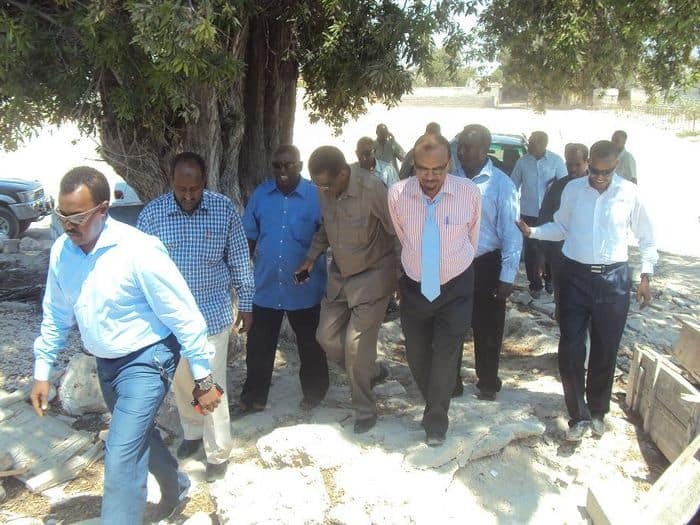 We always prioritized to have cooperation with governments for example the former sports minister Ahmed Abdi Salaam laid the foundation stone of the stadium just several years ago,” the NOC president stated. Somali deputy minister for youth and sports Dahir Hajji Guelleh said the ministry of sport, Somali Olympic committee and its federations isone family and that is the family of ‘sport’. “Before August last year, none of us could come here because of insecurity, let alone reconstruction. Now, we see signs of peace and development so let us benefit from the peaceful atmosphere and jointly promote our sport,” the deputy minister noted during his address. Somali state minister for sport Abdullahi Sheik Ali said Somali National Olympic committee and Somali Football Federation were praise worthy for working in the field of sports promotion in the country. “It is a great experience for all of us to come here together and jointly work on the development of sports in Somalia which is currently emerging from the era of armed confrontations. The neighboring countries always give us good hospitalities in the territories. But we hope to welcome their national teams to peaceful Somalia in the near future,” the state minister added. 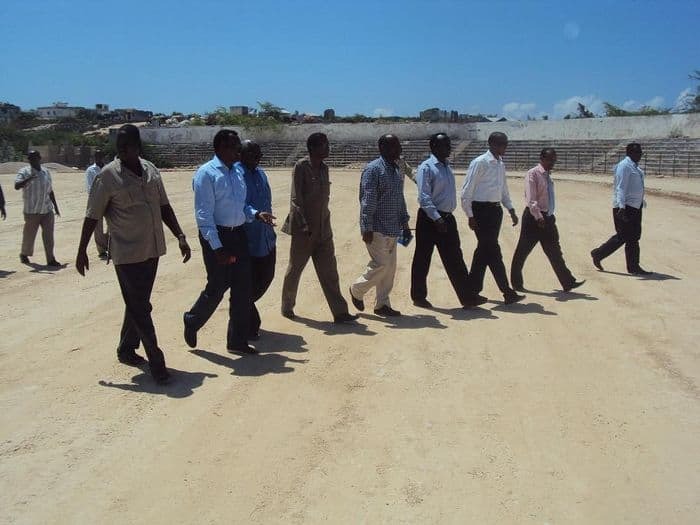 At the end of the hour-long inspection to the under reconstruction soccer stadium, the officials went to the Indian Ocean restaurant in the near by Lido beach resort of Mogadishu where the Somali Football Federation invited them to a luncheon. 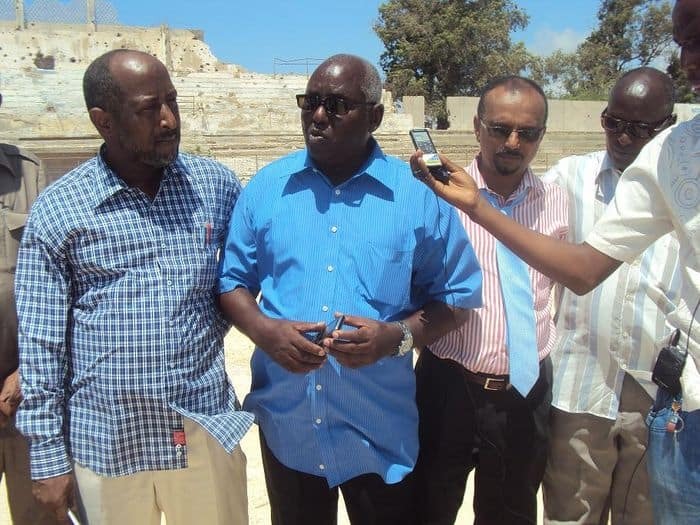 The recently-launched beach resort restaurant became the option for Somali National Olympic committee, the football Federation and other sporting organizations after its owner Mahmoud Hared named it as the ‘restaurant of sporting family.’ The owner announced a discount for all sporting individuals including officials, players, caches, referees and fans. Wednesday’s joint inspection to stadium Banadir was the first of its kind since the Somali NOC, Somali FA and the sports ministry agreed to forget the past differences and work together during a meeting at the ministry compound on the 19th of March. Shafi’i Mohyaddin Abokar is the NewsBlaze Somalia reporter, an experienced journalist. Shafi’i writes news stories, features and sends photos relevant to the current situation in Somalia.Shafi’i is also an international sports journalist and member of the international sports press association AIPS.He is a long-time sports journalist and reported from many international competitions including the Olympic Games.The photo shows Shafi’i at London 2012 Olympic Park.